Hormel Foods Corporation (NYSE: HRL) today reported its performance for the fiscal year 2009 fourth quarter and full year. The company reported fiscal 2009 fourth quarter net earnings of $103.9 million, up 53 percent from earnings of $ 67.8 million a year earlier. Diluted earnings per share for the quarter were $.77 this year compared to $.50 per share last year. Sales totaled $1.68 billion, which was down 10 percent from fiscal 2008. For the twelve months ending October 25, 2009, net earnings were $342.8 million, or $2.53 per diluted share, (up 22 percent) compared to $285.5 million a year ago, or $2.08 per diluted share. Sales totaled $6.53 billion, down 3 percent from $6.75 billion in the same period last year. “We are pleased to report an excellent finish to fiscal 2009. All five business segments contributed to our third consecutive strong quarter, generating a 54 percent increase in EPS and a 17 percent increase in segment operating profit. We are happy to get back on track with our long-term record of earnings growth after a challenging year in 2008,” said Jeffrey M. Ettinger, chairman of the board, president and chief executive officer. “Our Refrigerated Foods segment led the way with strong earnings resulting from an enhanced product mix bolstered by lower input costs. Our Grocery Products segment posted solid earnings results from lower year-over-year input costs for many items and behind the strength of increased sales and market share of our Hormel chili product line. Our Jennie-O Turkey Store segment benefitted from reduced production levels and lower input costs. A return to positive earnings comparisons by our Specialty Foods and All Other segments, lower freight and warehouse expenses across all of our business segments and improved investment income results also contributed to our strong earnings results,” explained Ettinger. “Although we are pleased with our earnings, we experienced disappointing sales in the fourth quarter. The decline in sales was attributable in part to lower commodity costs reflected in lower pricing in our pork and turkey complex, planned production reductions at Jennie-O Turkey Store, product rationalizations and some difficult comparisons from the prior year. In addition, we were also faced with a continued weak consumer environment that hampered sales efforts during the quarter,” Ettinger remarked. “For the full year, earnings per share grew 22 percent on a 3 percent reduction in sales. Four of our five segments posted increased segment operating profits over a year ago, and total operating profits increased 7 percent from a year ago,” stated Ettinger. “This morning, we announced an $.08 per share increase to our annual dividend rate (or 10.5%), making the new dividend $.84 per share. This is the 44th consecutive year in which we’ve increased our dividend,” Ettinger concluded. The Grocery Products segment achieved strong segment profit results with an increase of 12 percent from 2008, as a result of favorable raw material and freight and warehouse variances. Strong sales of Hormelchili also contributed to the segment profit increase. Sales declined as a result of a continued difficult consumer environment, particularly in the microwave product lines. The discontinued Carapelli joint venture comprised about a quarter of the sales decline, and increased promotional spending, difficult comparisons from a year ago and some product rationalization also contributed to the sales decline. Refrigerated Foods delivered another excellent quarter, with segment operating profit up 23 percent versus last year. Unfavorable spreads between hog costs and primal values were more than offset by a better product mix in both our Meat Products and Foodservice business units, as well as strong sales of such products as Hormel pepperoni,Lloyd’s barbeque products, and the DiLusso Deli Company product lines. Sales were softer overall, reflecting a weak foodservice sales environment and reduced prices of commodity pork, hams and bacon. Total segment profit for Jennie-O Turkey Store improved 6 percent from last year. Lower feed expenditures due to the planned reduction of turkey production helped boost their segment profit. The reduced production helped offset continued low commodity meat prices, by reducing our exposure to those markets. Sales of value-added products were constrained by challenging market conditions. Segment operating profit for Specialty Foods was up 9 percent, on mixed results within the segment. Strong private label performance by the Specialty Products business more than offset weak sales of nutritional and ready-to-drink products by Century Foods International. The All Other segment, which includes Hormel Foods International, surpassed last year’s segment profit by 53 percent. Profit improvement was achieved due to lower raw material and freight expenses, along with improved currency conditions. Export markets remained challenging due to the continuing weak global economy. Net interest and investment income improved $22.9 million from last year due to the significantly improved investment results of the company’s rabbi trust investments. During the quarter, general corporate expenses were higher than last year due to higher employee compensation plan costs. “Having returned to more normal earnings growth levels this year, we are confident in our ability to continue to enhance our bottom line. We intend to tackle the challenge of a continued weak economy and reduced consumer spending, and expect to restore top-line growth on an annualized basis in 2010. After assessing the important factors affecting our business for the upcoming year, we are setting our fiscal 2010 guidance range at $2.63 to $2.73 per share,” stated Ettinger. Effective November 15, 2009, the Company paid its 325th consecutive quarterly dividend, at the then annual rate of $.76. A conference call will be Webcast at 8:30 a.m. CT on Tuesday, November 24, 2009. Access is available at https://www.hormelfoods.com. If you do not have Internet access and want to listen to the call over the phone, the dial in number is 877-941-6009 and you must provide the access code of 4173819. An audio replay is available by calling 800-406-7325 and entering access code 4173819. The audio replay will be available beginning at 10:30 a.m. CT on Tuesday, November 24, 2009, through 11:59 p.m. CT on December 8, 2009. The Webcast replay will be available at 10:30 a.m. CT, Tuesday, November 24, 2009, and archived for one year. * Includes retrospective reclassification of shipping and handling expenses to cost of products sold from selling, general and administrative. 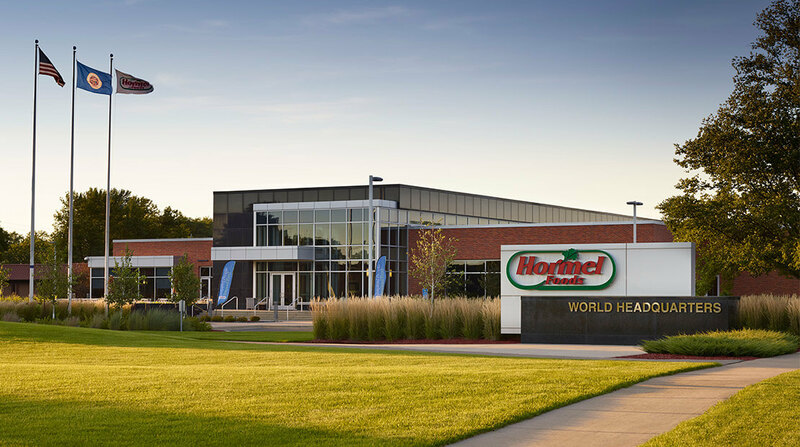 Hormel Foods Corporation Declares Quarterly Dividend The Hormel Foods Board of Directors declared a regular quarterly dividend of nineteen cents (19¢) per share on the common capital stock. Hormel Foods Corporation, based in Austin, Minn., is a multinational manufacturer and marketer of consumer-branded food and meat products, many of which are among the best known and trusted in the food industry. The company leverages its extensive expertise, innovation and high competencies in pork and turkey processing and marketing to bring quality, value-added brands to the global marketplace. The company is a member of the Standard & Poor’s 500 Index. Hormel Foods was named one of “The 400 Best Big Companies in America” by Forbes magazine for the 10th consecutive year. The company enjoys a strong reputation among consumers, retail grocers, foodservice and industrial customers for products highly regarded for quality, taste, nutrition, convenience and value. For more information, visit https://www.hormelfoods.com.